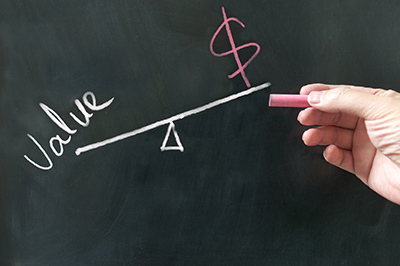 The Price vs. the Value of Gold… What is the Difference? When investing in gold, price and value are not created equal. The value of gold is measured beyond the daily spot price. Right now, as you read this post, the live spot price of gold is 1277.79 +2.91 . You may have just calculated your gains or losses based on when you purchased your gold. While the price of gold is important to understanding gold investments, you will find that it is gold’s long-term intrinsic value that has stood the test of time. While you read this post try to think about the longevity of your financial future. Let’s not consider today’s price of gold, rather how it has retained its value over time. 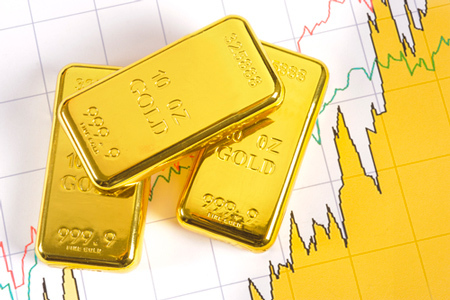 Buying gold is considered a safe haven against economic downturns and market uncertainty. Gold has the ability to preserve its purchasing power in ways that other investments do not. Gold’s worth is in its security and high quality performance over time as a preserver of wealth. While market forces, inflation and economic trends influence the daily price of gold, gold retains purchasing power regardless of price. In the 1920s, one ounce of gold was worth $20. A $20 gold piece could buy a man a fine suit and night out on the town while today a $20 bill could not cover a fraction of those costs. However, the cost of an ounce of gold today could still buy those same goods as it did in the 1920s. You may recall a national news story from 2014 when a California couple discovered over 1,400 twenty-dollar gold pieces buried in their yard. The stash, now referred to as the “Saddle Ridge Hoard“, was determined to be loot from a 19th century bank robbery, was worth over $11 million. If someone were to find 1,400 twenty-dollar bills, they would be priced at their face value (worth $28,000) which is worth much less than the gold today. Over time, both the content of the gold and the demand for the coin, now a rare, historical piece far exceeded the monetary equivalent of its $20 face value. This is how gold preserves your future purchasing power. Holding gold for the long term will hedge against inflation. When you are ready to “cash in” or liquidate to the currency in use- you will find that it will be convertible to a fair value… unlike the box of paper money in the floor safe. Take a look at the chart below which displays the increase in major purchases, goods, and commodities since 1971- the year the United States came off of the gold standard. Other than gold far outperforming the other data points, the most eye-opening number should be the average income in the United States- which has grossly under-performed against the other data points. You know the old saying “the dollar doesn’t buy what it used to”? Simply put: The dollar has been losing it’s purchasing power. While all the goods and major purchases increase around us, our income has not kept up with the pace. You may not have the money you think you do in your bank account. New banking regulations are making it more difficult to withdraw large amounts of cash due to banks being unable to keep sufficient cash reserves on hand. Imagine you walked into your bank and asked for a $1,500 withdrawal – knowing you had $10,000 in your account – just to be told that they could not give it to you. Unlike the money in your bank account, gold is a tangible asset and not just a number in a computer system. It is a private and secure way that you can hold your hard earned wealth outside the dangers of a fragile banking system. When you don’t have access to your “money”, having a private, tangible asset like gold makes its value, well, very valuable. This scenario may seem like a far-fetched and extreme circumstance, but in fact this has recently been a reality in some recent European countries such as Greece, France, Poland, Hungary, and Cyprus. 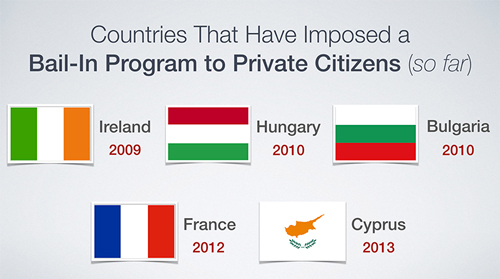 Citizens of these countries were denied access to their money with daily limits for withdrawals, and in some cases, were the victim of nationalized “bail-in” programs. The bail-in is a policy much like the “bail-outs” we saw here following the 2008 financial crisis. The difference? The banks needed to be “bailed out” by the government. In the case of the “bail-in”, the government is the one in need of financial help. Where does the money come from? You guessed it- you the taxpayer. Whether the funds come from pensions, taxes, or in some cases- private retirement accounts- the government could have full power and authority to seize the private assets from it’s citizens. Private gold is the line of defense you will want on your side in an economic environment such as this. Fiat currency – denoted in the paper bills we use today – is only worth as much as the government printing it can guarantee it for. Its worth is subject to many risks and uncertainties. Physical gold does not have the same ambiguity attached to it. It is a commodity with intrinsic value that has stood the test of time against currencies that have risen and fallen. If today’s currencies collapsed under the strain of government spending and borrowing, war, and further economic meltdowns, gold would be a safe haven: universally valued, a trade-able commodity, and a benchmark of wealth. Understanding the history of gold and money in the United States is important in understanding gold’s worth. From its beginning, the U.S. dollar was backed by or convertible into gold. 1787: An early clause in the Constitution prohibited states from making anything but gold and silver as payment tender. 1900: The Gold Standard was adopted that stated, “…gold…shall be the standard unit of value, and all forms of money issued or coined by the United States shall be maintained at a parity of value with this standard.” The Gold Standard guaranteed the dollar was worth 1.5 g of gold at that time. World War I: the Gold Standard was suspended (but eventually restored) as foreign entities liquidated their debts in gold. The Federal Reserve System was introduced and the U.S. Treasury issued emergency currency to assure debts to creditors. 1929: The Great Depression hit, Wall Street collapsed, and speculators began to demand gold in exchange for what was now almost worthless paper currency. Eventually nearly all of the world’s major currencies abandoned the gold standard in favor of fiat currency: essentially a piece of paper with a government promise of value attached to it. 1933: President Roosevelt passed the Gold Reserve Act banning private ownership of gold except for foreign exchange and revoking gold as a universal legal tender for debts. Roosevelt also raised the official price of gold to $35 per ounce, making the dollar more attractive to foreign buyers and foreign currencies more expensive for dollar holders. This led to more conversion of gold into dollars and allowed the U.S. to effectively corner the gold market. 1944: The Bretton Woods Conference takes place to set up a new, international monetary system. 1971: Nixon axed the Gold Standard completely. Dollars were no longer guaranteed by gold and the American economy suffered a devastating blow. How Much Longer Will the Dollar Remain as World Reserve Currency? The U.S. dollar has been the world reserve currency for over seventy years since the Bretton Woods Conference. When the Bretton Woods system was introduced, the dollar was still backed by gold. The dollar had replaced the British pound sterling as the world reserve currency. Now over twenty countries peg their currencies against the dollar and conduct trade in the dollar rather than their various currencies. Inflation and trade deficits have led to such devaluation of the dollar that the future of the dollar’s status as the world reserve currency is now murky. 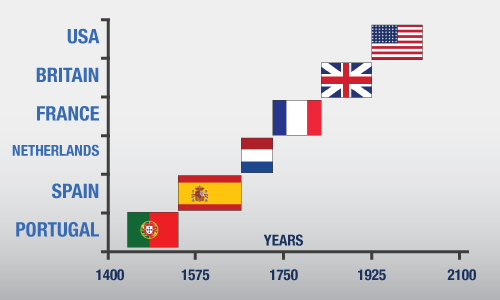 Nothing lasts forever– Here is the limited reign of the last five world reserve currencies previous to the US dollar. Protecting your money with gold is similar to owning a house. When you buy a house, it is more than just an investment. The house becomes your home. It has utility that extends beyond getting a return on your money. It provides shelter and stability. Unless you are a hedge fund or a billionaire, day trading gold is not advisable. Think of gold as insurance for your retirement account. In fact, it is even possible to own physical gold directly within an IRA, to reap the rewards of both the hedge value and the tax benefits at the same time. Historically, gold has always defied inflation, posted profits, and most importantly- been in global demand. For certain, the same cannot be said for Enron or Blockbuster shareholders who purchased stocks, giving control to outside institutions. Ask yourself this: if you plan to retire in 15 years- will your money be there for you? As investors, we own gold for the future, not for tomorrow or next month. In summary, as you look toward your financial future, keep in mind that the price of gold today is not the sole determinant for investors looking to secure their long term finances. It is what the value will be when you need it most 5, 10, or even 20 years from now. As Economist Oakley R. Bramble wrote “Gold bears the confidence of the world’s millions, who value it far above the promises of politicians, far above the unbacked paper issued by governments as money substitutes. It has been that way through all recorded history.” By taking control over your physical assets you eliminate the chances of your investments being subject to unpredictable actions by the government and other institutions. With the national debt at an all-time high, and government finances in turmoil, the need to preserve and secure wealth is ever more present.